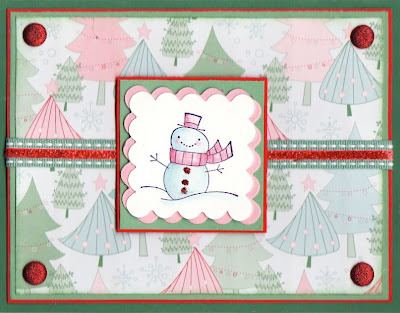 The Shabby Stamper: Sweet Snowman! I'm having to say that these red Glimmer Brads are my big fun new toy! I'm already on my second box and I think that I'm going to have to stock up on these babies before the Holiday Mini no longer exists. LOVE THEM!! Love the non-traditional colors - Yes, the red makes it pop! Super card! What a great card, love the soft colours and the glitter brads.